Nothing screams cozy like a giant bowl of Italian Chicken Tortellini Soup. Simple and comforting – this soup hits the spot every-single-time. Confession: We’re already knee deep in October and I’m deep in denial. Is Summer really over? Is Fall really in full swing? Is Winter really creeping up like mega fast? 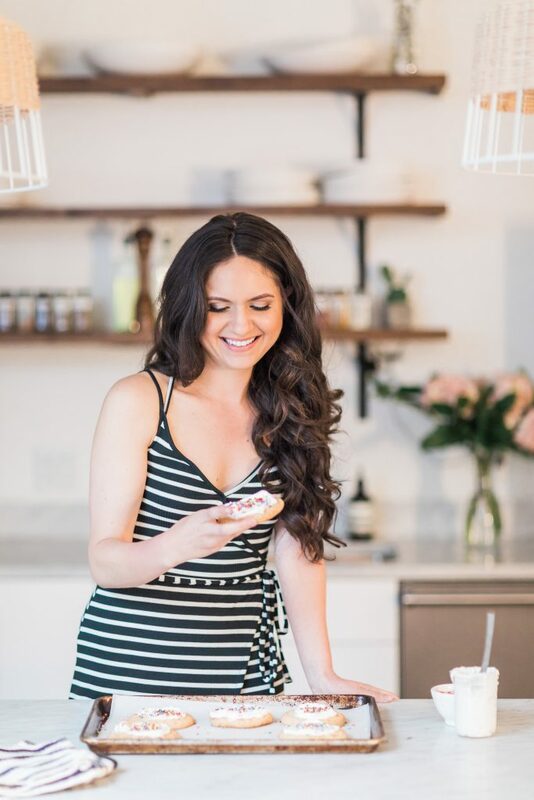 ↑↑↑ I think we both know the answers to those (very obvious) questions… but in my mind, I’m still on the beach wearing my hot pink bikini and sipping on a fresh peach margarita. ♥♥♥ Hey, a girl can dream right?! Since dreams can only take us so far, I decided a delicious new recipe was just the ticket to easing into Fall. Enter this soup! 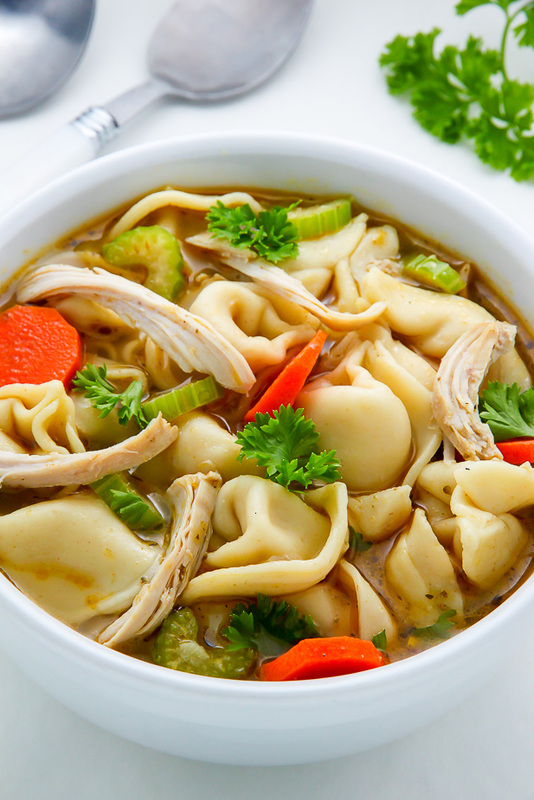 This is an Italian tortellini version of my beloved flu fighter chicken noodle soup. It’s simple, healthy, hearty comfort food at its best. Loaded with roasted chicken, cheese tortellini, crunchy carrots, celery, and onion – every bite is exploding with flavor! 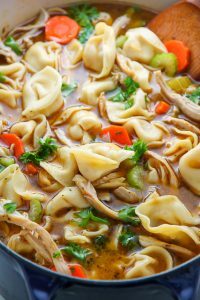 Whether you feeling a nasty cold coming on, are looking for a new favorite soup recipe, or just want to make a giant pot of cozy comfort food for dinner, this Chicken Tortellini Soup Recipe is a sure winner. I hope you guys love it as much as we do! 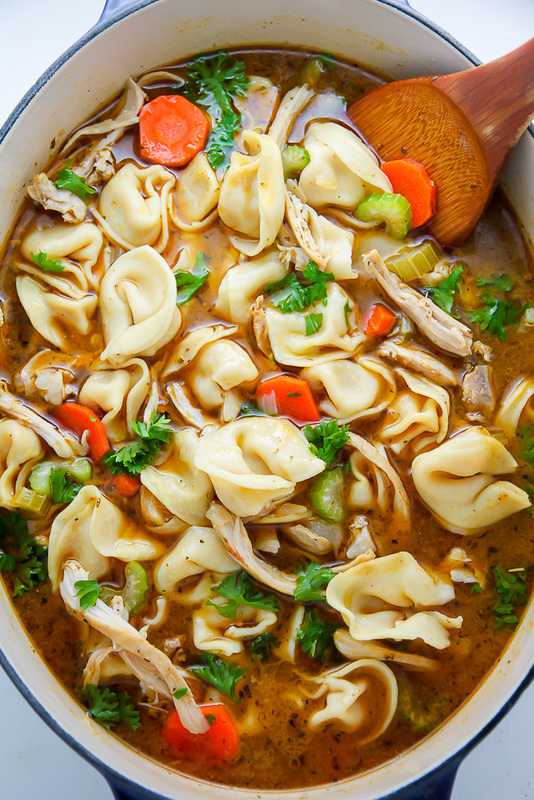 Hearty and flavorful Italian Chicken Tortellini Soup is perfect for chilly nights! Preheat oven to 375 degrees (F). Place chicken tenders in a large baking dish lined with parchment paper. Drizzle with olive oil and sprinkle with spices. Place pan in the oven and bake for 25 minutes, flipping the chicken at the half way point. Once cooked, transfer the chicken to a cutting board and shred it into small pieces using two forks. 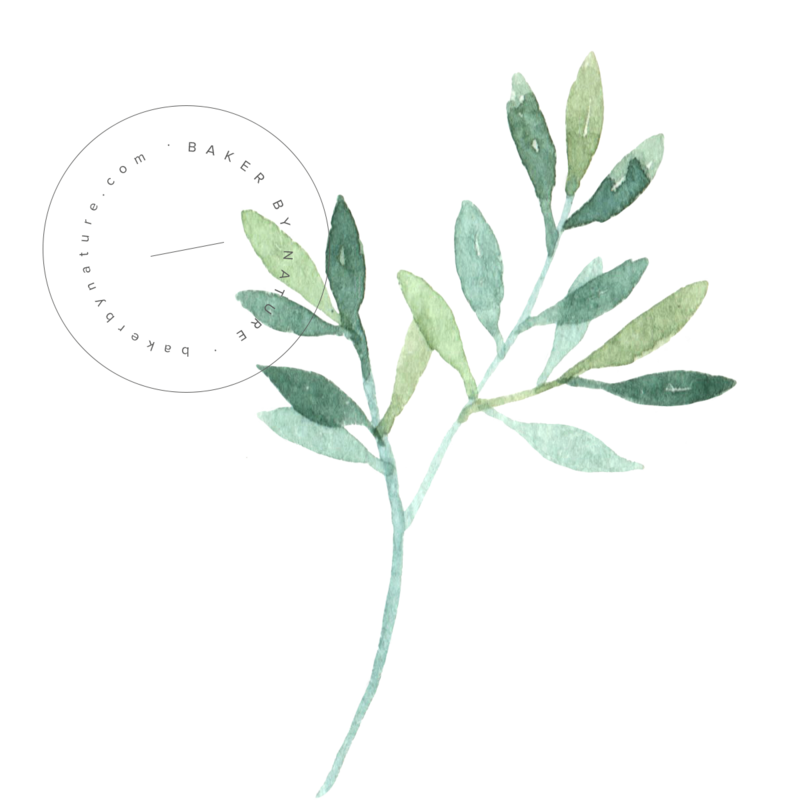 Heat olive oil in a large, heavy bottomed soup pan over a medium flame. Add carrots, celery, and onion; cook - stirring occasionally - for 8-9 minutes. Add garlic and salt and cook for another minute before adding the bay leaf and chicken stock. Increase heat to high, bring soup to a boil, then reduce heat to medium-low. Stir in tortellini and simmer for 10 minutes, or until the vegetables are soft and the tortellini is cooked. Stir in the shredded chicken, Parmesan cheese, lemon juice, and parsley. Taste soup and adjust seasoning as needed. Serve warm. although…I’m sorta liking the idea of soup, now that you mention it. This soup looks SO hearty and delicious and perfect! Doesn’t Summer always go by too fast? Tale as old as time 😉 But at least we can take comfort in giant bowls of soup!!! Made this soup tonight perfect for a rainy December night. Was very easy to make followed the recipe exactly and came out DELICIOUS. Will definitely be permanently adding this to my soup recipes! I am SO happy to hear it, Michelle! Thank you for letting me know you enjoyed this soup recipe – it’s one of my favorites! oh my goodness! this was just amazing! I made it tonight… I did add half a small bag of chopped, fresh baby spinach when I added in the chicken though. I also made a quadruple batch of the meat seasoning and put it in a bottle in my spice rack… the chicken was amazing just out of the oven… Thank you for sharing this recipe! I am going to make a double batch up to freeze! Best homemade chicken soup to ever grace my tastebuds! Is the tortellini in this reciepe frozen? Hi Betty Jo. I did not use frozen tortellini, buy you definitely can! Thanks so much!!! My family made it today for dinner with some homemade rolls!!! Yummy! It was a little spicy, but we loved the kick. (My kids not so much). Thanks for the great reciepe!! My 10 year old made her own cookbook to keep all of her favorite recipes she cooks. This was the first one to go in. She loves it and it is easy enough for my little chef to make. To make this super quick….buy the refrigerated tortellini, make a frozen carrot, broccoli, etc in the microwave add to the broth. Then add your seasonings and a rotisserie chicken that you cleaned up! Might not be super healthy…but it is super FAST!! Can you use an already cooked rotisserie chicken? If so, do you add spices to broth? Hi Jessica. I think you’ll definitely need to season the soup if you use precooked chicken. I would start with a small amount of spices, then add more to taste. Made this tonight and it was delicious! My picky husband loved it also right before he put a bite in his mouth he complained about the ricotta cheese in the tortellini’s . Yet he ate two helpings. Thank you ! !